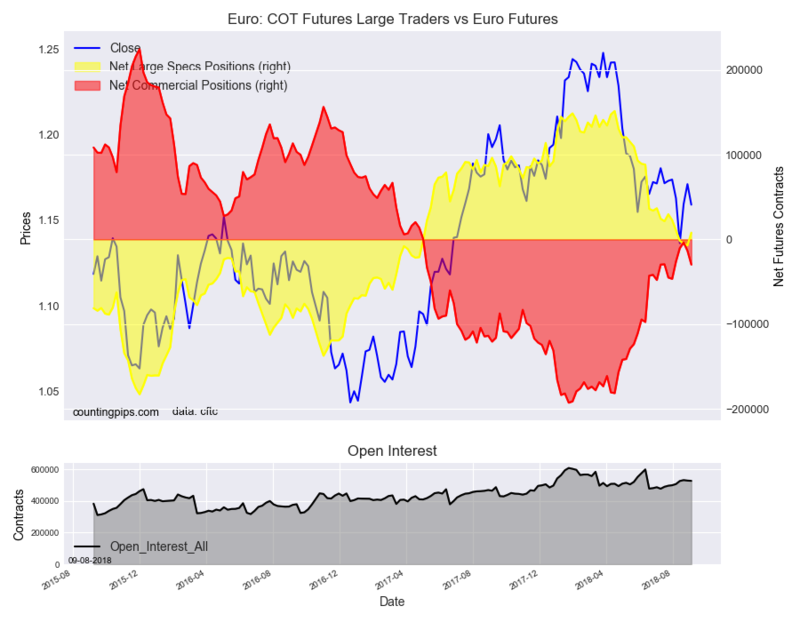 The latest data for the weekly Commitment of Traders (COT) report, released by the Commodity Futures Trading Commission (CFTC) on Friday, showed that large speculators cut back on their bets for the US Dollar Index futures markets this week for the first time in twenty weeks. 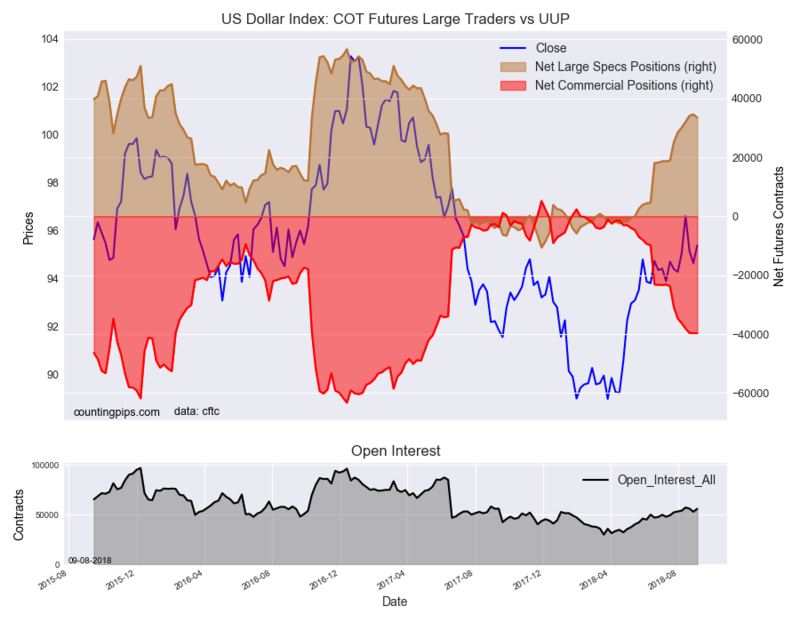 The non-commercial futures contracts of US Dollar Index futures, traded by large speculators and hedge funds, totaled a net position of 33,486 contracts in the data reported through Tuesday September 4th. This was a weekly decline of -1,085 contracts from the previous week which had a total of 34,571 net contracts. Speculative bets in favor of the US Dollar Index had gained for the previous nineteen weeks in a row to the highest level since May of 2017 before this week’s decline. Despite the shortfall, the bullish position remains above the +30,000 contract level for a fifth consecutive week. In the individual currency contracts data, we only saw one substantial change (+ or – 10,000 contracts) in the speculators category. 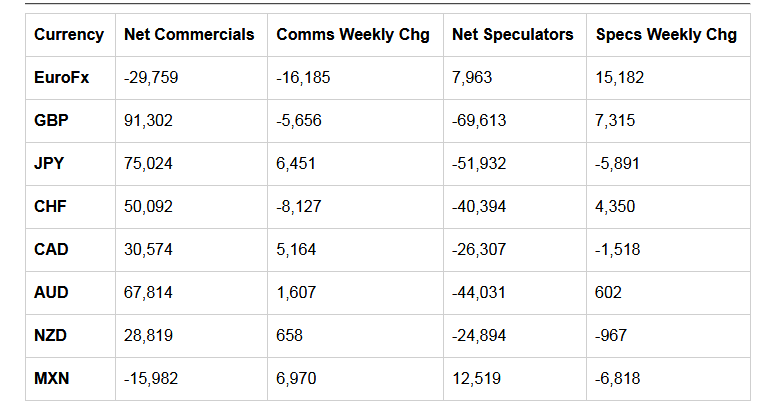 Overall, in the major currency contracts on the week, speculators bet in favor of the euro (15,182 weekly change in contracts), British pound sterling (7,315 contracts), Swiss franc (4,350 contracts) and the Australian dollar (602 contracts). The currencies whose speculative bets declined this week were the US Dollar Index (-1,085 weekly change in contracts), Japanese yen (-5,891 contracts), Canadian dollar (-1,518 contracts), New Zealand dollar (-967 contracts) and the Mexican peso (-6,818 contracts).